2018 marked another very successful year for the World Wide Education Series, sponsored by Contamac Ltd. A series of live webinars in conjunction with live performances at various locations around the world ensured that generic specialty lens education is available as an ‘open access’ source to almost all eye care practitioners who have a passion for specialty lenses and really want to make a difference for their patients. First and foremost, scleral lenses as a topic were certainly among the most popular this past year. We have come a long way with scleral lenses. It has been almost 10 years since the initiation of the first edition of a book – The Scleral Lens Guide – which accompanied the resurgence of modern scleral lenses. Ten years of modern scleral lenses have shown – to the surprise of even the most passionate and enthusiastic supporters of the modality – the incredible potential of scleral lenses. They have become very popular as well as one of the main lens modalities for irregular and challenging corneas. The first edition of Contact Lens & Anterior Eye in 2019¹ features a special on sclerals, with 19 new papers on the topic. 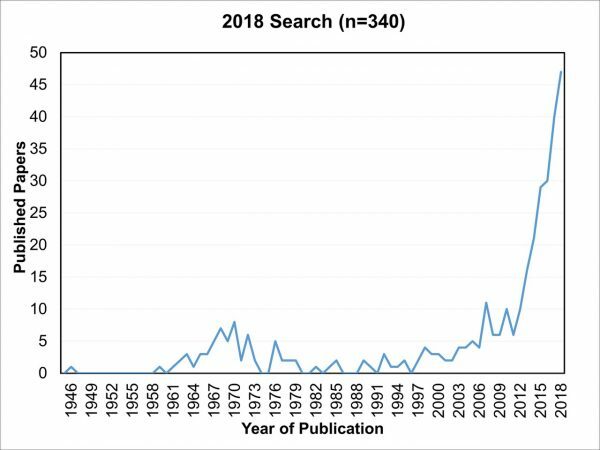 The editorial of the issue, compiled by guest editors Melissa Barnett, Lynette Johns and me, includes a graph (see fig 1) that demonstrates the rise and hence the interest in scleral lens publications in the last few years. The first meeting solely devoted to scleral lenses was held in Rome, in June 2018, by the Accademia Italiana Lenti Sclerali and under the supervision of Daddi Fadel. Here, the pros and cons of scleral lenses were discussed in depth by experts from around the world and on the highest level thinkable. But the education series wasn’t just about sclerals. The traditional series of lectures at the University of Bloemfontein in South Africa, organized in conjunction with local faculty member and optometry lecturer Lauren Coetzee, included many topics, with bifocal lens fitting being the most popular and most sought-after lecture every year. Needless to say, presbyopia is one of the biggest opportunities, but also challenges, in our field. Within corneal GPs and increasingly with scleral GPs, the options are diverse, with an arsenal of different options (especially in the corneal GP range) and all with superior optics. The biggest problem with soft lenses is that they ‘drape’ over the cornea (inferior optics) and that they cannot translate (move) over the cornea. Understanding the pitfalls, including the decentration of the lens optics (as described in last year’s coverage) can really help with soft bifocal lens fitting. 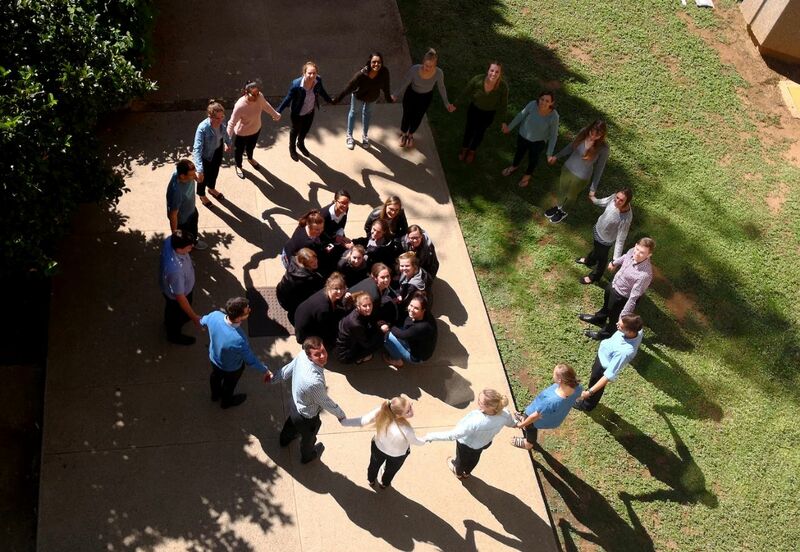 To ‘prove’ that the students at the Bloemfontein University ‘got the point,’ they sent us a picture illustrating the pupil decentration relative to the geometric center of the cornea (fig 2). This is a hopeful understanding, as the future of soft bifocal lens fitting may lay – at least partly – in lenses with decentered optics. Whether opticians, optometrists or ophthalmologists: the World Wide Education Series does not focus on any profession or level of education in particular. The latter – ophthalmology – was quite a popular target audience throughout this education year. In October, the ECLSO (European Contact Lens Society of Ophthalmology) was held in Mandelieu-la-Napoule, France, with a number of topics presented, including sclerals, but also ‘the lost art of soft lens fitting.’ A super interactive workshop (in which the audience was able to choose their preferred topics) with Ken Pullum, Greg DeNaeyer, Lynette Johns and Carina Koppen was held multiple times, during which practical scleral lens topics were raised and discussed. An ophthalmology meeting (SMOC) in Morocco in October had its theme around ‘corneal astigmatism’ and ‘dry eye.’ A perfect theme for discussing the benefits of scleral lenses in ocular surface disease as well as ‘the future of fitting the irregular cornea’ with sclerals. In February, in Utrecht, Netherlands, a presentation was given at a study day for a large group of ophthalmologists-in-training about the pros and cons of contact lenses and the benefits that specialty lenses can provide. An ophthalmology meeting in Antwerp, Belgium earlier in the year focused on non-surgical approaches for myopia control, where the contact lens options were discussed and shared. Myopia is certainly is a topic that is gaining more attention and momentum. It features one of the most popular, yet most controversial, topics: myopia management. More and more lectures within the World-Wide Education Series focus on this topic, which is interesting because it brings a number of things together from the specialty lens industry: orthokeratology, of course, but also bifocal lens designs (used to slow down myopia progression), corneal health issues and lens optics & design, plus the quality of soft lens fitting in general. Almost a ‘myopia mania’. Still, at the same time, there are many questions about the topic, and a dilemma remains about what we can tell, and promise, parents of myopic children at this point. Last but certainly not least, the World-Wide Education Series had a large presence in South America in 2018. In addition to very well-attended translated live webinars, lectures were given in Santiago de Chile and at the ‘Contactología Sin Fronteras’ meeting in November in Buenos Aires, Argentina. The title ‘without borders’ is exactly what we need when it comes to soft lens fitting: we have to look beyond the standard lines of thinking. The meeting in Argentina was very well attended and held in a tango-theatre – which was appropriate, as I have seldom witnessed an audience more passionate (as in tango dancing, I suppose) than this crowd in Buenos Aires. Passion and ‘without borders’ – is a great summary of what this World-Wide Education series is about. In line with Contamac’s World Wide Education Series, since 2010, Contamac has been the exclusive sponsor of Soft Special Edition, a quarterly newsletter on soft specialty contact lens research, developments, designs and materials (www.softspecialedition.com). Readers from all over the world have subscribed to this educational newsletter, which goes out to over 4000 specialty eye care practitioners and is available free of charge. To sign up, simply visit the Soft Special Edition website. 1. Van der Worp E, Barnett M, Johns L. Scleral Schism. Cont Lens Anterior Eye. 2019 Jan;42(1). Courtesy Rute Juliana Ferreira Macedo de Araújo – University of Minho, Braga (Portugal).